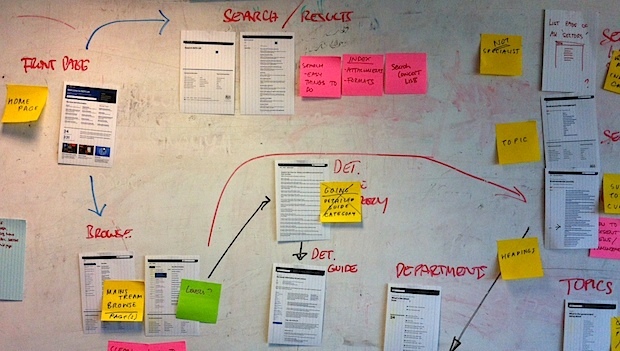 I’ve recently been analysing how users navigate their way around GOV.UK and want to share the findings. There were more than 56 million visits to GOV.UK in September 2014, a new monthly record. 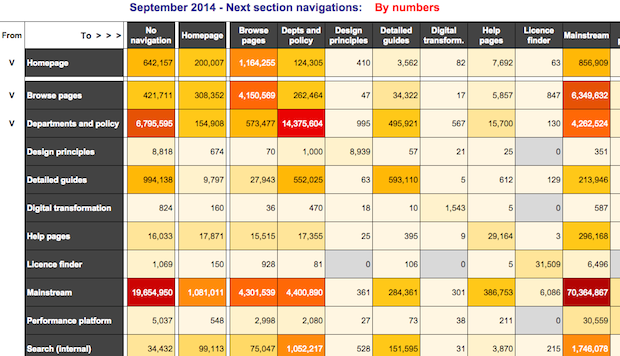 My task was to summarise where users landed in the site and the extent to which they browsed to other sections. The vast majority of sections on GOV.UK can be determined by the top level URL structure or from the page title. For example, mainstream browse pages all sit in the folder “/browse/” and detailed guides are labelled in their page titles. It can be reasonably assumed that most of the remaining pages belong to mainstream content (which currently don’t have an identifier in the URL or page title). I set up custom filters in Google Analytics which aggregated all the pages within each section to allow this analysis to be done. I wanted to condense the user activity in the month down to one page summaries. By cleaning and rearranging the data I produced heatmaps which showed the relative navigational relationships between the different sections of the site. 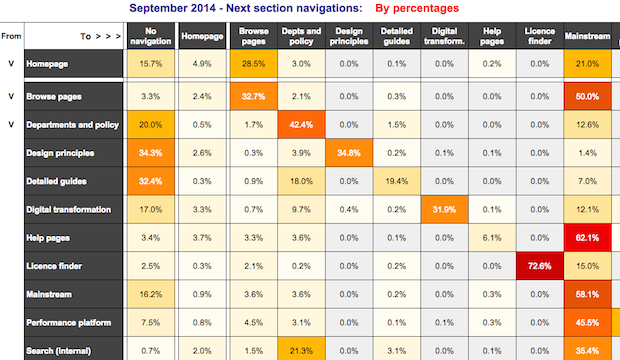 The heatmaps represent every navigation made on the site in September 2014 from one section to another. They include the instances where users didn’t navigate anywhere (known as ‘bounces’) or where the next navigation was to leave the site. I’ve also included instances where users’ next navigation was to a page within the same section. Note that due to the way the underlying data is filtered in Google Analytics, the numbers will not be exactly correct but a very close representation. Note also that at present it’s not possible to break down exits made due to a click on an external link from the site. Click on the image to open the full version. This heatmap shows section navigations by numbers. The sections on the left show where users navigated from, the ones at the top show where they went to. The corresponding cell shows the approximate number of times this occurred in September, with the colour portraying the relative frequency. The ‘hotter’ or darker the colour, the more times the navigation took place. For example, there were more than 6 million times when users went from a mainstream browse page to a mainstream content page. This second heatmap breaks the data down by the percentage of navigations made from each section to provide another interesting perspective of the data. The heatmap was achieved by totalling all the navigations in a row and then calculating the percentage for each section. If these heatmaps generate enough interest, we’ll continue iterating them in the future as GOV.UK develops further. In the meantime, if you have any suggestions for improvement please leave a comment.